Forum Index > Off-topic Talk > The Dresden joust of 1936? Posted: Tue 08 Sep, 2009 7:17 pm Post subject: The Dresden joust of 1936? 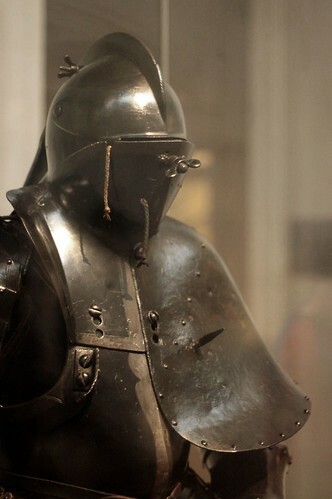 A German joust armor, painted black and with a very large grandguard, is in the Metropolitan Museum of Art. It is accompanied by a text stating that it was last used in 1936! The harness was made for the Scharfrennen ("sharp running") or joust in an open field with sharp lances, according to the description. There are apparently 29 other identical harnesses, all from the armory at Dresden, some of them blackened and some polished. What I want to know is, are there any records of this tournament which was supposedly held in 1936 or at any time during the 1900s? Here's a picture of what I'm talking about; some here will probably have seen it already. I own an original 16mm film reel from the jousts at Dresden. Mine is dated 1938. It is still in its original tin with all the German Government (at the time) markings. I recently had it professionally cleaned up and transferred to DVD and that particular harness doesn't make an appearance. I understand that they did the jousts a few times so it may have been used at a different time. It is amazing to see the original armours, horse armours and saddles being used!!!! Any chance you might manage to get that posted on Youtube , or similar, for us here on myArmoury.com to view? I'm going to second Torsten's request. That sounds too cool to not be on YouTube! I never knew that the Nazis had jousts. I've seen several publicity photos of SS members in fluted gothic armor at rallies and such but a joust is taking it to another level. I have to admit that I am surprised that they would use the original stuff! Please put it on YouTube and post the link!!!! !